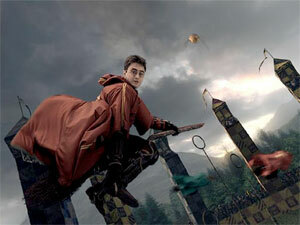 Universal Orlando Resort is set for a public grand opening of The Wizarding World of Harry Potter on June 18. Last week, they revealed details of one of three Harry Potter themed attractions, Harry Potter and the Forbidden Journey. This attraction is the heart of The Wizarding World of Harry Potter, inside Hogwarts castle, which towers of the park, and combines story with new technology to create a immersive experience. As you venture through Hogwarts castle, you meet Harry, Ron and Hermione who convince you to skip a planned lecture and follow them. Upon taking their advice, you travel by Floo powder, and begin the adventure as you soar over Hogwarts, narrowly escape a dragon attack, have a close encounter with the Whomping Willow, get pulled into a Quidditch match and more. The Wizarding World of Harry Potter was created as a 360-degree theme park experience, combining live-action, advanced robotic technology and innovative filmmaking. The full attraction experience, including the queue, takes about an hour. For more information, visit www.UniversalOrlando.com.